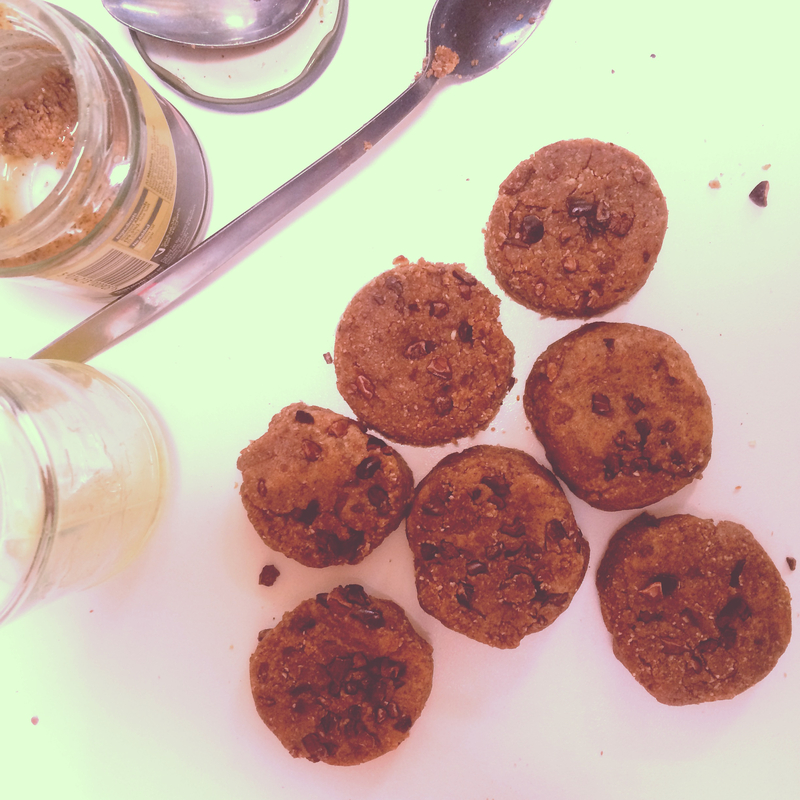 Balance your blood sugar and stay energised for hours with raw almond butter chocolate chip cookies! Balanced blood sugar levels are an essential part of managing our mood, our energy levels, and ensuring we don’t reach for the sugar-packed chocolate bar when four o’clock rolls around…. Plus, it’s SUMMER and we need all of our energy to get outside and have those Summer adventures. Blood sugar levels or blood glucose levels are determined by the amount of glucose or sugar that is present in the blood. It is this glucose which is one of the main sources of energy for our cells, and the body very closely regulates how much or how little is present in order to stay balanced. Our blood glucose levels are lowest in the morning upon waking up, which is why we do need certain natural sugars like fruit to get us going in the mornings, and slow release carbohydrates such as oats which will keep us feeling good for a long period of time – unlike sugary processed cereals which give an initial boost of artificial energy, and a resultant crash soon after…. If our blood sugar levels tend to stay consistently high, this is known as hyperglycaemia and can be a cause of diabetes, whereas low blood sugar is referred to as hypoglycaemia. If you notice yourself regularly feeling dizzy, a little faint, shaky, irritable or lethargic after not eating for a few hours, this could indicate that you’re swaying towards low blood glucose levels. This is pretty common, and just means that it’s a good idea to keep snacks handy and to eat regular, healthy amounts of wholesome food every few hours to keep blood sugar levels balanced. This doesn’t mean reaching for chocolate, cake or sugar every 3 hours though, it means choosing nutrient dense foods which will fuel your body and brain and benefit your cells. Luckily, these raw cookies are the perfect healthy alternative to that mid afternoon chocolate bar, and will keep you feeling full of energy for hours! The gluten free oats in this simple five minute recipe help to maintain balanced blood sugar levels, give a great mood boost, and provide long lasting energy. Raw almond butter is a brilliant source of vegan protein, helping to build lean muscle and keeping our metabolism strong. Protein is also useful in itself for stabalising blood sugar levels. Raw cacao contains tons of antioxidants, fibre, and iron to help prevent fatigue. Apricots and dates also pack in high amounts of fibre – important for a healthy digestive system, as well as a hit of instant energy from their fruity sweetness. Vanilla extract (optional) – Helps to lower levels of anxiety, and is also thought to be an aphrodisiac, should you be in need of that for any Summer romances…. If your mixture is looking a little dry, add in a small amount of water to help the ingredients bind. When everything is combined, take your mixture out of the blender and place on a chopping board or plate. Form a dough-like ball with the mixture using your hands, and then flatten on to the plate or chopping board. It’s your choice how much you flatten the mixture, obviously this will effect how thick your cookies come out, and how many of them you get. Sprinkle however many raw cacao nibs you like over the flattened doughy mixture and gently press them down so they’re stuck in to the ‘dough’. From here, using either a cookie cutter – or if you don’t have one of those, use the top of a jam jar – to cut your shapes. And there you go, keep cutting out your cookies until you have enough to keep yourself and everyone else energised for the rest of the day with your healthy, wholesome and delicious snacks!